A second-half drought on offense was enough to upend the Oklahoma State’s bid to win its third straight game. The Cowboys fell 73-69 against Baylor on Monday night in Gallagher-Iba Arena. For 7 1/2 minutes in the latter stages of the second half, OSU didn’t make a bucket. It led 60-54 with a little more than eight minutes remaining. With 59 seconds left, Curtis Jones hit a layup, cutting Baylor’s advantage to 67-66. Another problem for the Cowboys (8-9 overall, 2-3 Big 12) has been finishing at the rim this season. It continued against the Bears, as OSU finished 6-of-20 on layups. It finished 9-of-28 on shots inside the arc while nailing 13-of-29 from deep, though Baylor had an answer for every 3. The Bears (10-6 overall, 2-2 Big 12) missed two 3-pointers in the first half while nailing 11, taking a 40-35 advantage to the break. Baylor finished 15-of-25 from deep, making as many 3s as the Cowboys had allowed in their previous three contests. 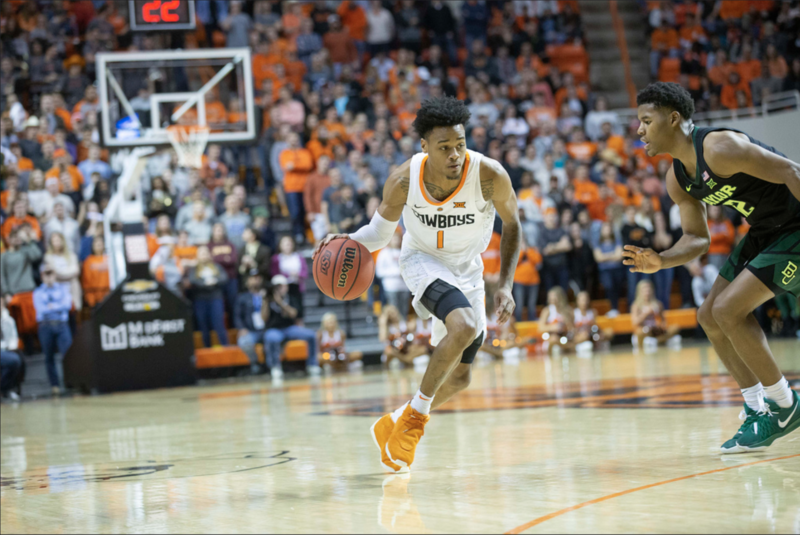 OSU had four players reach double digit scoring figures, with Jones’ 18 points leading Cowboy scorers. Cameron McGriff added 15 points and tallied his fourth double-double in six games, grabbing 10 rebounds. Yor Anei and Lindy Waters each poured in 11 points. Baylor’s King McClure scored 29 points, making seven 3s. After playing in his first game since November against West Virginia, freshman center Kentrevious Jones wasn’t in GIA on Monday night. Following the game, coach Mike Boynton told reporters, including those with The Oklahoman, Tulsa World and The O’Colly, that he was unsure whether Jones would remain with the program. This is Jones’ second suspension this season, as he missed four games for the first one because of “team discipline,” as Boynton put it in December. Jones played five minutes against the Mountaineers and was a +5, showing improvement on the defensive end after struggling early this season. The Cowboys travel to Ames, Iowa, on Saturday to face the Cyclones at 5 p.m. The game will be televised on ESPNU.